Aroma Range Chemicals – Chemicals like fatty esters and Natural Essential/ aroma oils which caters to gamut of Personal Care, Cosmetics & Toiletries, Flavors & Fragrances and Pharmaceutical segments. Food Antioxidant Range Chemicals – TBHQ (Tertiary-butyl hydroquinone), BHA (Butylated Hydroxy Anisole), AP (Ascorbyl Palmitate) and various complementary antioxidants which are used in various food products. Lube Range and Rubber Range Chemicals – Additives including Aminic Antioxidants, Molybdemum based Extreme Pressure & Anti Wear Additives and Corrosion inhibitors and chemicals like Benzotriazole and Tolytrizole which are required by the Petroleum and Synthetic Lubricants industry. The company also caters to leading processors of rubber in the Auto Ancillary, Tyre Industry, Construction, Industrial Machinery and White Goods sector. Speciality Range Chemicals – Electroplating chemicals, Intermediates for API/Bulk Drugs, UPR Resins/ Fibre Composites Resins, Thermoplastics Urethanes (Polyurethanes), Printing Inks & Agrochemicals etc. For the six months period ending 30 September 2017, the company generated 53.05% of its revenues from export markets. 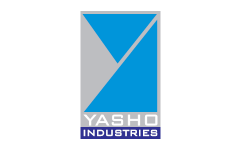 Yasho Industries IPO allotment status is now available on Bigshare Services' website. Click on this link to get allotment status.